Boca Inlet is an upscale waterfront condominium community situated on the glistening waters of Lake Boca Raton. This twelve-story condominium building features just under 100 private units that offer one to three bedrooms and range in size from 830 to 1,700 square feet of luxurious living space. The complex features 24-hour security and spectacular panoramic Intracoastal views in Boca Raton, FL. Originally constructed in 1965, Boca Inlet recently underwent major renovations which included remodeling of the hallways, installation of crown moldings, and replacement of all windows and doors throughout the building with hurricane resistant glass. Many condos for sale in Boca Inlet have been completely remodeled and updated to include many high-end features. Boca Inlet condos have upgraded kitchens with granite counters, stainless steel appliances, and custom cabinetry, crown molding, luxurious bathrooms with marble baths, and large master suites with walk-in closets. These luxurious condos also offer spacious balconies with sweeping views of Lake Boca and the Intracoastal Waterway. The HOA dues at Boca Inlet cover the maintenance of the common areas, management and security, building insurance, as well as water, sewer, and trash removal. Boca Inlet is located on Camino Real on the East side of the Intracoastal Waterway in Boca Raton, FL. With its premier waterfront location, life at Boca Inlet feels like being on a permanent vacation. Nearby destinations include South Inlet Park and Downtown Boca Raton which offers plenty of fabulous restaurants and shopping. The community is also within walking distance to the beach, the exclusive Boca Beach Club, and the world-famous Boca Raton Resort & Club. 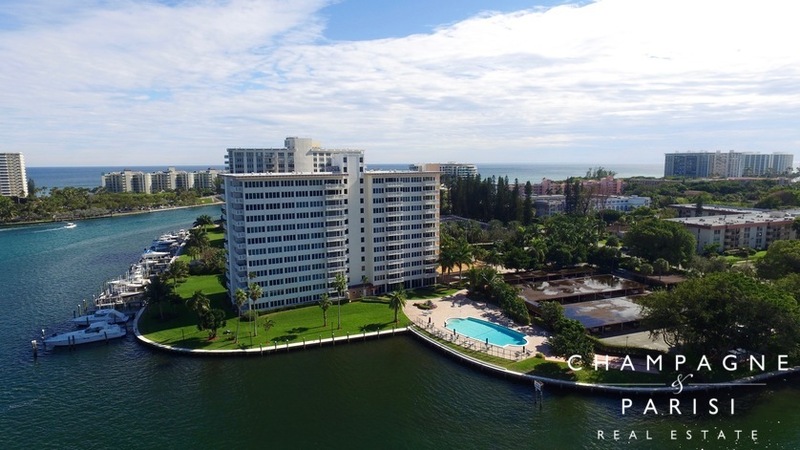 If you are interested in purchasing a condo for sale at Boca Inlet, other waterfront condos that you may also want to visit include Lake House South and The Carlton, which also offer luxurious waterfront living on beautiful Lake Boca Raton. If you would like to learn more about condominiums for sale in Boca Inlet or any of the surrounding waterfront condominiums in Boca Raton, please contact us at 561-998-9015. You may also contact us by completing the online contact form provided below. We at Champagne & Parisi Real Estate look forward to assisting you in finding your next dream condo!